Designed in 2007 by the renowned architectural firm, Herzog & de Meuron, 40 Bond Street is a uniquely designed apartment complex located in NoHo, Manhattan. The building is distinguished for its “coke-bottle green” facade and was listed on the Harvard Graduate School of Design as Project No. 253, “Bond Street Apartment Building”, or as some New York insiders call it, “Bond. 40 Bond”. The 11-story facade of 40 Bond is 5,364 square feet and consists of 27 units, including five “townhouses” or triplex apartments, entered at ground level with their own backyards and tiny forecourts facing Bond Street. A low-maintenance, protective coating was requested by the developer and architects (pre-installation) to shield the glass on the distinguished New York apartment building from stains and scratches, as well as to help promote long-term sustainability. After thorough research, the specific coating chosen by the architects was CRICURSA Shield (DFI nano-coating). Joan Tarrus, Marketing Director of CRICURSA, stated, “Diamon-Fusion glass treatment can be applied to any glass built-up (laminated, IGU, tempered, flat, and curved). And unlike other ‘self-cleaning’ coatings, Diamon-Fusion fills in the micro-flaws of the glass, making the surface water-repellent, as well as easier and faster to clean. The entire “coke-bottle” facade was fashioned from curved glass panels manufactured in Barcelona by DFI Licensee, and highly specialized architectural glass producer, CRICURSA. 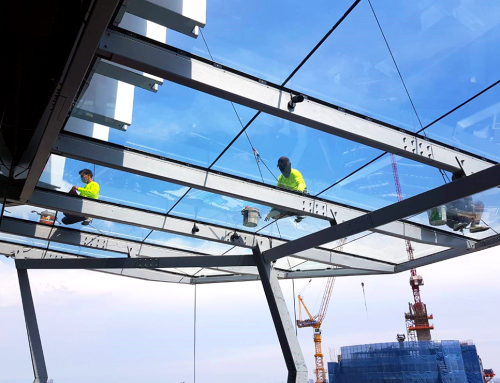 The Company’s coating CRICURSA Shield was applied to the glass pre-installation, ensuring maximum output and uniform coverage on every glass unit. Diamon-Fusion creates an invisible, high-performing barrier that prevents rainwater, dust and other pollutants from sticking to the exterior glazing, leaving owners with a beautiful, more brilliant surface. By filling in the microscopic peaks and valleys of the glass surface, water, dirt and other environmental contaminants cannot embed themselves in the glass, protecting it from future staining and etching. Similar in functionality to a non-stick cooking pan, Diamon-Fusion treated glazing repels rainwater, concrete leaching and other contaminants, resulting in easier and less frequent cleanings. By producing a smoother water-repellent surface, high-performing windows stay cleaner for longer – creating a better aesthetic appeal, while maintaining higher occupancy rates.